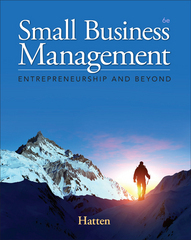 Small Business Management 6 Edition SMALL BUSINESS MANAGEMENT provides a balanced introduction to both entrepreneurship and small business management, with a focus on achieving and maintaining a sustainable competitive advantage as a small organization. Current issues, including global opportunities, service, quality and technology, are highlighted throughout the text. The online Business Plan Guide and templates provide some of the most extensive information available on business planning.